Imagine if a building could function like an iPhone. That idea struck Rudin Management’s John Gilbert III when he waited at Joe’s Pizza on 14th Street in 2009. The two Rudin executives had emerged from a meeting with Consolidated Edison in which the utility giant made an offer: Con Edison would send Rudin a data feed that gave one of New York City’s biggest landlords a 30-second early warning ahead of a catastrophic event affecting its grid, such as the 2003 blackout that left the metropolis without power for two days. Gilbert wanted the alert, but he was unsure how Rudin could use the data feed to reprogram building systems across its expansive portfolio in a matter of seconds. The iPhone in Gilbert’s pocket sparked a discussion over pizza that led Rudin on a years-long development process that birthed Nantum, its proprietary smart building system. Rudin now has plenty of competition. 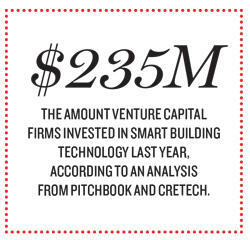 Venture capital firms invested $50 million in real estate technology in 2012, but that sum rose to $9.6 billion last year, about $285 million of which went toward companies that invest in smart buildings, according to an analysis by PitchBook and data and conference platform CREtech. Outside the VC world, real estate investment trusts and major institutional landlords are now investing in smart buildings, said CREtech’s chief intelligence officer, Ashkán Zandieh, who noted that many companies are doing so quietly in an effort to beat competitors. Between the in-house development of systems such as Rudin’s Nantum and companies making hardware purchases, “business is booming,” Zandieh said. Earlier this year, a Deloitte survey of executives at 500 global institutional real estate investors found that 26 percent plan on prioritizing smart building technology into building design or renovations, and 55 percent believe that doing so will future-proof assets. 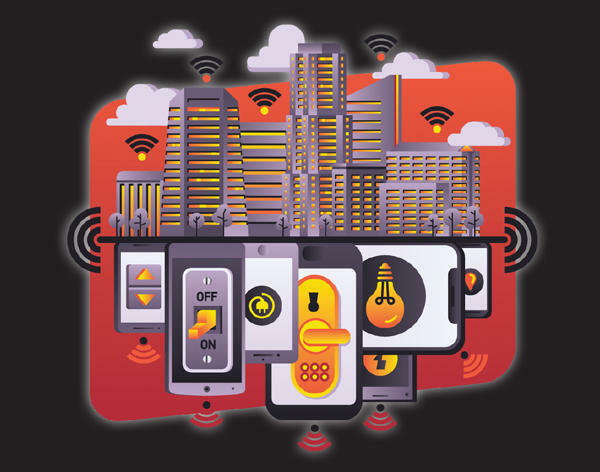 Smart buildings must have the Internet of Things (IoT), an umbrella term for the operating systems that outfit a building’s infrastructure with a network of sensors that relay information to one another. Some IoT systems can integrate with external data sources and use artificial intelligence or machine learning. Michael Beckerman, founder and CEO of CREtech, said such systems are usually offered as an amenity or an “infrastructure play,” but rarely both due to the significant resources required to develop them. Nantum, Rudin’s IoT system, uses data from cameras, sensors and external sources such as Con Edison’s data feed to integrate a single platform that operates all aspects of a building’s operation, such as when most people get to work, the areas of an office they visit most, how much water they use and how long it takes to heat up or cool down a certain area. Gilbert said one of Nantum’s biggest “wins” was identifying a leak on a Sunday morning at 845 Third Avenue. Nantum detected unusually high water use and alerted the building manager with a text message. That early detection capability to limit potential property damage saw Rudin pay $1 million to deploy Nantum in 17 buildings last year, Gilbert said. Nantum, run through a Rudin family-owned technology affiliate called Prescriptive Data, saved the real estate company $5.5 million in energy costs last year. Prescriptive Data now sells the software as a service — Gilbert said customers are charged 10 cents per square foot for access — to landlords in Connecticut, Illinois, Massachusetts and New York. Although some residential buildings use Nantum, it’s mostly used in commercial properties. When Stillman Development International president Roy Stillman set out to repurpose the old Times Square Theater, installing the latest technology and analytics was an obvious way to redefine a flagship property. 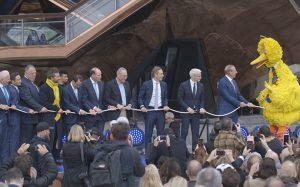 “It’s hard to imagine a cutting-edge building not having data harvesting capabilities,” Stillman said. He decided that unlike Rudin, his company should purchase such equipment rather than create it. The Times Square Theater, built in 1920 and owned by a nonprofit, is being outfitted with low-voltage wiring and microphones to pick up cell phone signals that retail tenants can use to track customers as they linger near certain products or price check items on Amazon. “It’s really your mobile phone that is a portal to the data,” said Stillman, explaining that as a landlord he won’t control or handle data collection. Instead, tenants will have the “design freedom” to program interior and exterior signage and displays to harvest customer data, Stillman said. His development firm simply supplies the smart trappings. The repositioning of the former theater’s 52,000 square feet will cost roughly $100 million, or what Stillman estimated is about “three times the cost per square foot as a superior residential building.” Stillman, who holds a 73-year lease on the property, hopes that by turning to IoT systems, the building will become a retail mecca that will attract such tenants as Amazon, Apple and Coca-Cola. Smart building systems aren’t just for traditional landlords. Co-working and shared-space companies are also getting in on the action. Convene, a shared workspace provider that partners with landlords to provide such amenities as conference rooms and catered gourmet food, is developing a mobile app system called Elevate. Once operational, the app will sync the movements of Convene members with its services. A mobile phone with Elevate on it will act as a building security pass and allow members to get food delivered to their workspace. ”We see [Elevate] as being a connective tissue,” said Convene co-founder Christopher Kelly, who once oversaw the app’s development. Elevate now operates in three locations. The We Company, a key real estate technology player, declined to discuss how its IoT system processes how co-workers use the configurations of its various properties, which can be altered to affect their members’ behavior. Last year, a research team studied how the placement of staircases affected social relationships in two WeLive facilities. A similar analysis fueled the We Company’s redesign of its Manhattan headquarters. As data collection and analysis advance, the market value of information gathered as people move through stores or go about their work day is increasing. In Deloitte’s survey, respondents said that data harvested from IoT systems was their preferred criteria in making investment decisions. Jennifer King, director of consumer privacy at Stanford Law School’s Center for Internet and Society, said that outside the technology industry there is a low level of awareness, expectation and understanding about how data is collected in certain environments.